Stop by Island Mazda near Union, NJ to experience the all-new 2018 Mazda3 5-Door. Our most technologically advanced Mazda is equipped with our most technologically advanced cockpit. With MAZDA CONNECT, our next-generation infotainment system, you get a host of entertainment and information options. All you have to do is pair your smartphone with the Mazda3 via Bluetooth to stream your favorite content. MAZDA CONNECT makes staying informed and entertained effortlessly. Everything is easily controlled with the Commander control on the center console or via the 7” full-color touch-screen. A connected driving experience should even include your sense of hearing. That’s why the Mazda3 offers an available Bose Centerpoint 2 Surround Sound System. Delivering clear audio through nine speakers, it lets you enjoy an immersive surround sound experience from nearly any source, including CDs, MP3 devices, radio broadcasts and available SiriusXM Satellite Radio. Plus, it’s been fine-tuned to reproduce sound for the Mazda3’s specific interior dimensions. So you get a lifelike surround experience from any seat in the house. While other car companies compromise power to improve fuel efficiency, Mazda has taken a dramatically different approach. Far more than just an engine with hybrid-like efficiency, SKYACTIV TECHNOLOGY is a holistic system that takes the entire car into consideration, delivering a series of innovations that work together to improve the overall driving experience. 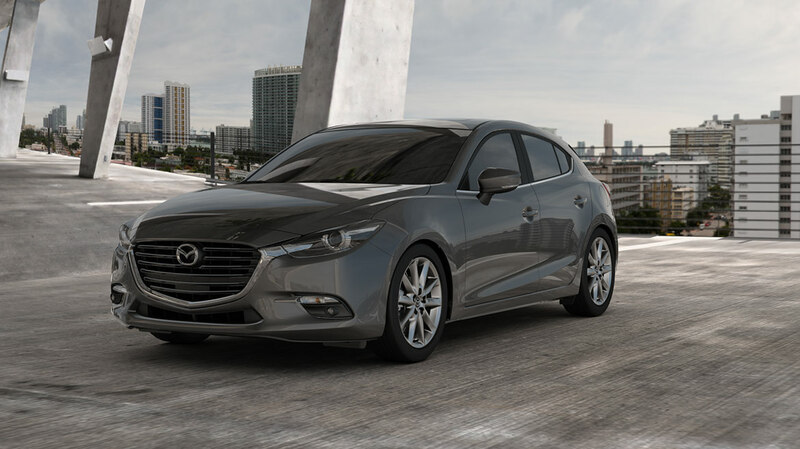 Power and performance are delivered in abundance, along with efficiencies that allow the Mazda3 to offer up to an astounding EPA-estimated 37 highway MPG. The Mazda3’s Electric Power Assist Steering allows you to feel the road while Dynamic Stability Control helps your wheels grip the road during quick turns. Precise, powerful and performance-oriented, the Mazda3 proves that more than ever, passion and performance are in its blood. Mazda’s latest technology, SKYACTIV-VEHICLE DYNAMICS with G-Vectoring Control, helps achieve a smoother, less fatiguing drive for you and your passengers. It’s a highly efficient vehicle motion control system that operates in the background during a spirited drive. When cornering, the system works seamlessly by adjusting power delivery and shifting vehicle weight. The effect is subtle, but how you feel after a great drive isn’t. Why go to these lengths? Because we believe no detail is too small when it comes to making driving better. Come by Island Mazda near Union, NJ to test drive the powerful 2018 Mazda3 5-Door. You can also browse our online inventory of Mazda3’s here. We look forward to doing business with you!